The new reference of passive 3D stereo monitors with all leading GIS applications - in practice test and experience live on 8 INTERGEO exhibition stands! Geo-IT experts will once again meet at the world's leading trade fair, INTERGEO 2018, which will be held this year from 16-18. 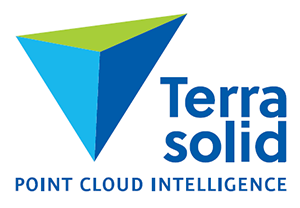 October 2018 on the grounds of Messe Frankfurt in hall 12 (trade fair) and in the portal house (specialist congress). The leading scientists and professional users in the fields of GIS, Geospecial- and Photogrammetry travel from all over the world and will inform themselves in the three days on numerous lectures and directly with the manufacturers about the latest developments. 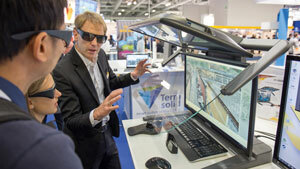 The theme of visualization will once again be an important topic at INTERGEO this year. Schneider Digital e.K. 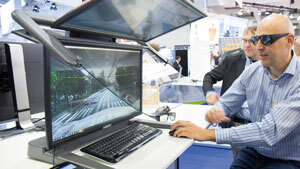 therefore shows its 3D PluraView monitor family LIVE to the interested professional audience. For detailed product advice on the 3D PluraView and GIS hardware solutions (GIS performance PC systems, GIS mice and input devices, high-end graphics cards, etc.) we are at your disposal. The "Plug & Play" enabled 3D PluraView Monitor has established itself last year in the 4K 10-bit (UHD) version as a 3D stereo reference. Due to its very high resolution of 3.840 pixels per eye new applications in the BIM, the 3D city model or in laser scanning (LIDAR) arise. Passive stereo monitors enjoy the highest user acceptance of all 3D display technologies available on the market. Long-term experience with highly-skilled users working in shifts, who have been working with the monitor for over 10 years, shows that 3D PluraVIEW technology is the measure of all things here. The optimized beam splitter technology with higher color fidelity and guaranteed, absolute flicker-free resolution at the highest resolution enables extremely relaxed working in all 3D PluraVIEW variants, thereby measurably increasing user motivation. 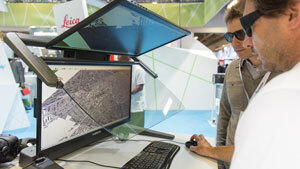 Thanks to the brightness of two monitors, 3D PluraVIEW users can now work on a window seat themselves. The wide viewing angle of about 170 ° also supports this high viewing comfort when working in a team. Even if three or four employees are sitting in front of an application to discuss solutions, everyone involved has a perfect view of the 3D project.